Sharman Burgess Sports Cup, round three: Benington 5 Ruskington Rovers 2, Boston College 5 Eagle United 4, FC Hammers 1 Kirton Town 5, Fishtoft v Railway Athletic - away win, Fulbeck United 1 Skegness United 2, Leverton SFC 4 Coningsby 0, Spilsby Town 1 Skegness Town Reserves 1 (Skegness won 4-2 on pens), Swineshead Institute 1 Pointon 0. Workforce Unlimited Premier Division: Old Leake 7 Wyberton Reserves 3. 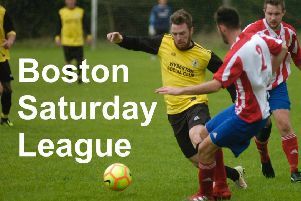 Workforce Unlimited Division One: Friskney v Old Doningtonians - postponed, Horncastle Town Reserves 5 Woodhall Spa United 2, Pointon Reserves 1 JFC Boston Seniors 3, Sibsey 2 Swineshead Institute Reserves 4. Workforce Unlimited Division Two: Coningsby Reserves 1 Caythorpe 6, FC Wrangle 1 Boston International 3, Fosdyke v Boston Athletic - postponed, Railway Reserves v Colsterworth - postponed, Wyberton A v Park United - postponed. Workforce Unlimited Division Three: Digby 2 College Reserves 5, Northgate Olympic 7 Leverton Reserves 1, Old Doningtonians Reserves 6 Swineshead A 1, Skegness Town A v Woodhall Spa Reserves - postponed, Spalding Harriers 3 Mareham United 2.